Fragrance Free Facial Cleansing Wipes -- 100% perfume and alcohol free is rated 5.0 out of 5 by 9. Rated 5 out of 5 by Anonymous from make up free wipes ive been usong this wipes for almost a year and I can say that this is one of the effective and best wipes Ive tried in my face. especially when im tired from work and dont want to wash my face anymore, I just use this wipes and all my worries about the make up on my face are gone. 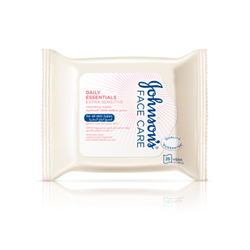 Not just just it also leaves my skin smooth for almost the whole night thats why I am a johnsons fan since ages. Rated 5 out of 5 by almy from easy to carry It helps me remove makeup and excessive dirt after a long day at work , and Before sleeping when I feel so tired to go n wash m face I prefer this wipes to cleanse my face. It is a lifesaver for me since more than a year. Aqua, Cyclopentasloxane, Isononyl Isononanoate, Pentaerythrityl Tetraethylhexanoate, Isostearyl Palmitate, Cetyl Ethylhexanoate, Hexylene Glycol, Stearyl Ethylhexanoate, PEG-6 Caprylic/Capric Glycerides, Socrose Cocoate, Panthenol, Magnesium Aspartate, Zinc Gluconate, Copper Gluconate, Glyceryl Oleate, Ascorbyl Glucoside, Coco-Glucoside, Hydrogenated Palm Glycerides Citrate, Carbomer, PEG-4 Laurate, Ethylhexylglycerin, Citric Acid, Sodium Hydroxide, Benzoic Acid, Phenoxyethanol, Dhydroacetic Acid, Iodopropynyl Butylcarbamate, Polyaminopropyl Biguanide.